Sunscreen is extremely important to me. It is the one thing I will not skimp on and the one thing that is absolutely essential to anti-aging skincare. If you use sunscreen then approximately half of your aging concerns will not exist. The other portions are not smoking and genetics. Using sunscreen from an early age is essential to keep your skin looking young and beautiful. I wish I had known this when I was little. The skin on my arms is so freckled is is unbelievable. My face is doing pretty good because I have been using anti-aging products for years now. My legs have been hidden by clothes and are white. 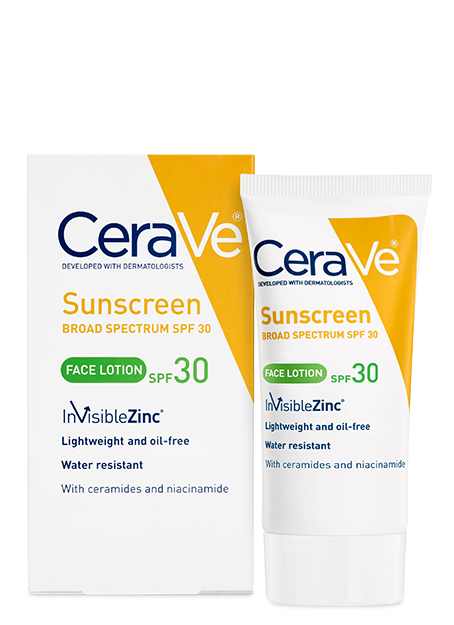 Today I am going to review two of my favorite sunscreens, CeraVe SPF 30 with InvisibleZinc. This sunscreen is lightweight, oil-free and water resistant for up to 40 minutes. It also contains ceramides and niacinamide to help repair and restore the skin's natural protective barrier and support the skin's fatty acids which are essential for repairing and restoring the skin barrier. It can also soothe skin's redness. This sunscreen is like no other sunscreen you have seen. You get powerful sun protection from the zinc oxide, which is a mineral sunscreen, that comes in a lightweight formula with a clear finish and absolutely no white film on the skin. This is a high performance, water resistant formula, suitable for all skin types and is perfect for daily use. InvisibleZinc Technology uses a revolutionary naturally derived source of microfine zinc oxide to deliver its unique dry, clear finish for powerful protection against the sun's damaging rays. It contains Titanium Dioxide 3.7% and Zinc Oxide 3.5% total for the sunscreen to come up with a SPF30. They are both mineral sunscreens and are good for those who cannot handle chemical sunscreens. This is a broad spectrum sunscreen, meaning it will help to protect skin against UVA and UVB rays. UVA are the ones that you tan with and can cause skin cancer. UVB are the ones that burn you and definitely cause cancer. All sunscreens that you wear should be broad spectrum and should protect against both types of rays. What I like about this sunscreen is that it instantly sinks into the skin, which is unusual for a mineral sunscreen. It lasts for a long time and does not make the skin feel oily. It just feels like it has some lotion on it. Not heavy though. Skin feels protected and you can put your makeup on right after application. I am very happy with this sunscreen and it may be my new daily sunscreen for good. I personally prefer mineral sunscreens, because they are natural and there have been some studies that have linked some of the chemical sunscreens to some cancers. But titanium dioxide and zinc oxide are all natural and work wonderfully at reflecting the sun's rays away from the skin. Chemical sunscreens absorb the sun's rays. This sunscreen for the body is similar to the one for the face. It also contains SPF30, which comes from Titanium Dioxide 3.67% and Zinc Oxide 3.5%. It is also a mineral sunscreen like the one for the face. It has the invisibleZinc Technology, which is used to keep the thick white film from forming on the body after application. Instead you have a revolutinary naturally sourced microfine zinc oxide that delivers its unique dry, clear finish for powerful protection from the sun's damaging rays. It also contains ceramides to help repair and restore the protective skin barrier. This sunscreen is a high performance, water resistant sunscreen that is suitable for all skin types. It is great for daily use on the even the most sensitive of skins. It is great for those who cannot tolerate chemical sunscreens. It comes in a lightweight formula that dries quickly and dries clear. 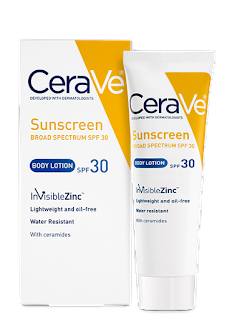 Developed with dermatologists, this sunscreen is a breakthrough for many who cannot wear many sunscreens. I also like this sunscreen. It is lightweight in nature, water resistant to 40 minutes, and is great on the skin because you don't really feel it after you have applied it. It just kind of soaks in and the skin feels slightly like a lotion was applied. This is for those who cannot tolerate chemical sunscreens or who love zinc oxide sunscreens because they bounce the damaging rays off the skin. It is very similar to the facial sunscreen, so that is why I like it so much. In fact, I do believe that if I was in a pinch I could use this on my face. 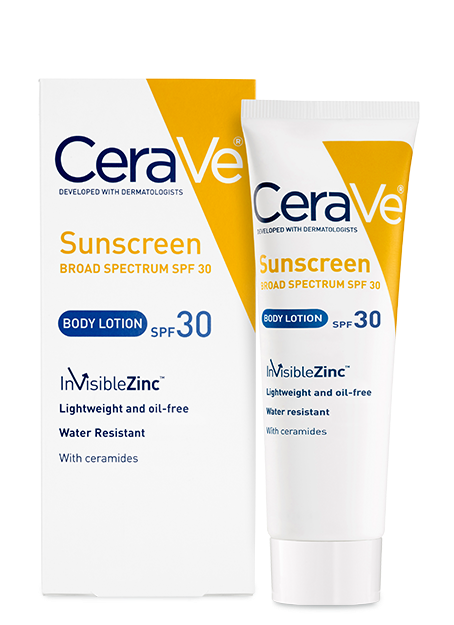 CeraVe can be found online at www.amazon.com. It can be found in mass market stores such as Walgreens, CVS, Rite-Aid, Target and WalMart. 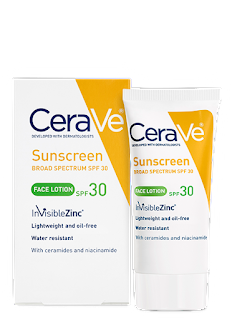 Like CeraVe on Facebook: https://www.facebook.com/CeraVe and Follow CeraVe on Twitter:@ceraveskin.